Guys! Does this bring back memories?? Top Row (L-R: Angelo, Prasad, V___, ___, Floyd, Anand, Brian, Rahul, Dolreich, ___, Aziz, Ashwin, Jean, ___. 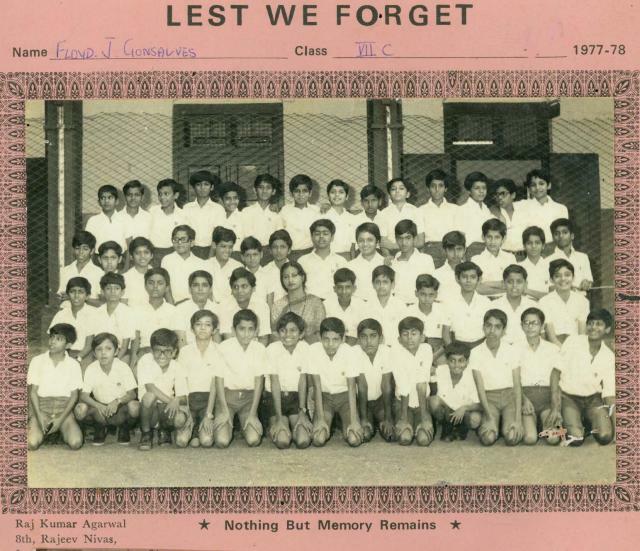 Second Row: Neil, Savio, Glen, Ravi, Sanford (late), Phillip, Rohan, Samir, ___, ___, Neil, ___, Floyd, Paul. Seated: Robin, Arthur, Farooq, Farookh?, Dale, Tr. Kusum, ____, ___, Romal, Andre, Neil, Sean, Mahesh?. Bottom Row: ___, Leon, ___, ___, Richard, ___, Shabbir, ___, ___, Mario, ___, Hemant?, ___. Submitted by delroy on April 11, 2012 - 7:47pm. Submitted by Charlesmisquitta on April 11, 2012 - 4:58am. Wow i have searched for a picture of me in any school group photo couldn't find one till now. I am in row two from the top 5th from the right, to my right hand side is Umesh Kathwani. Submitted by Rodney Cardoz on April 10, 2012 - 2:51pm. I would like to add a comment although I am logged in under Rodney's account. I am Pierre and am third from bottom left. Good to see this picture mate!